I've talked briefly before about how the game can provoke an emotional reaction by how something is executed. 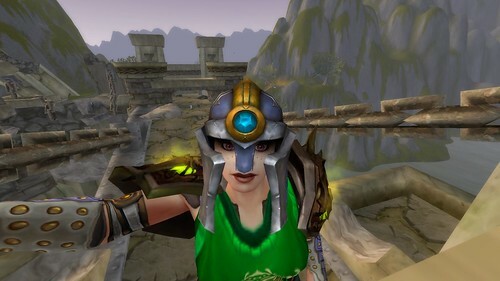 I was on the Thandol Span between Wetlands and Arathi Basin to take a selfie for the Field Photographer achievement and a memory washed over me, a remembrance of a quest chain I hadn't thought of in years. Blizzard is known for dropping cultural references into the game and this was no different. At the game's development, interest in the US Civil War was at an all-time high thanks to Ken Burns and his documentary. The themes of lands torn apart by war, of brother against brother and the sheer loss of life resonate within the game as well as without. One of the more poignant quests was a little known one by the Thandol Span. There used to be a quest where you had to find out what happened to the dwarf stationed on the left side of the span. What you can't see in this selfie is that the left side of the bridge is shattered. There is a column leaning precariously over the water. Inside was a dwarf who was manning the post as he should be. In order to get to him, you had to jump from the Arathi Highlands side (behind me) to a ledge on the pillar. Missing the ledge meant you fell into the water below. Once you completed the quest, the only way to get back to the mainland was to jump into the water and swim to the ramps leading out of the water. It was in the water that the Sully Balloo Letter quest was obtained. It was hard to find this quest. Sully is dead, crushed by bridge sections. If you didn't know he was there, it would be extremely easy to miss him. You would see a hand, outstretched, from under this massive block. When you moused over the hand, a cog wheel would appear. Clicking on the hand gave you a letter with instructions to take it to Sully's wife, Sara, in Ironforge. There was no quest to lead you to the body. You either had someone who told you about it or was one of the people who moused over everything so you found it or you read about it. I had someone who knew about it take me to find the letter. Sara was and still is, in the Military ward, standing silently on the porch of her home. When you handed her the letter, she would weep, thank you, give you some coin and ask you to take a letter to Magni Bronzebeard, the then ruler of the dwarves. He would accept the letter and the text said that he "looked past you, struggling with his emotions". He thanks you and gives you some coins and that was it. I can't find the text of Sully Balloo's letter, but it was very similar, though not as long due to game constraints, to the letter written by one Sullivan Ballou before the first Battle of Bull Run. This letter was well-known to any Civil War buff who played the game. This was probably the first time the game and the things I was asked to do resonated emotionally with me. You cannot get the quest anymore. It was removed with Cataclysm. I'm not sure why Blizzard considered it obsolete and removed it, but it's gone. As I stood overlooking the bridge, I remembered that this simple 2 step quest solidified the game as something I wanted to play. Sara stands in Ironforge still, waiting for word from her soldier.